Helping you run a productive, efficient business at valuable prices! We’re switched on when it comes to ordering IT equipment and consumables. We have developed a specialist technology division to specifically cater for today’s office environment. 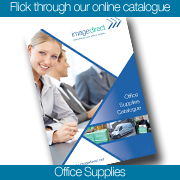 We do not simply add the popular IT products to our general office supplies, but we offer a comprehensive range of technology products from IT consumables to machines and accessories. Together with informed support to assist our customers purchase decisions. We can cater for both the general office environment through to the more specialist needs of our customers IT functions. You can be assured that your IT function benefits from the same coordinated procurement systems and service proposition available to the whole business while supporting your specific IT requirements at valuable for money prices.